For generations, historically Black colleges and universities (HBCUs) have been essential institutions for the African American community. Their nurturing environments not only provided educational advancement but also catalyzed the Black freedom struggle, forever altering the political destiny of the United States. 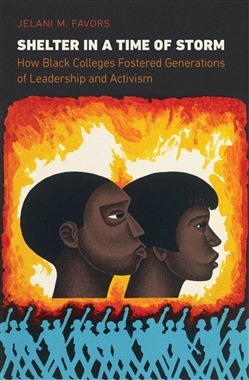 In this book, Jelani M. Favors offers a history of HBCUs from the 1837 founding of Cheyney State University to the present, told through the lens of how they fostered student activism. Favors chronicles the development and significance of HBCUs through stories from institutions such as Cheyney State University, Tougaloo College, Bennett College, Alabama State University, Jackson State University, Southern University, and North Carolina A&T. He demonstrates how HBCUs became a refuge during the oppression of the Jim Crow era and illustrates the central role their campus communities played during the civil rights and Black Power movements. Throughout this definitive history of how HBCUs became a vital seedbed for politicians, community leaders, reformers, and activists, Favors emphasizes what he calls an unwritten "second curriculum" at HBCUs, one that offered students a grounding in idealism, racial consciousness, and cultural nationalism. Acquista Shelter in a Time of Storm in Epub: dopo aver letto l’ebook Shelter in a Time of Storm di Jelani M. Favors ti invitiamo a lasciarci una Recensione qui sotto: sarà utile agli utenti che non abbiano ancora letto questo libro e che vogliano avere delle opinioni altrui. L’opinione su di un libro è molto soggettiva e per questo leggere eventuali recensioni negative non ci dovrà frenare dall’acquisto, anzi dovrà spingerci ad acquistare il libro in fretta per poter dire la nostra ed eventualmente smentire quanto commentato da altri, contribuendo ad arricchire più possibile i commenti e dare sempre più spunti di confronto al pubblico online.